Alex pointed to the stage, and out walked 'The Monster'... GARGANTUAN!! An impressive win for James Hernandez here against a brilliant fighter in Harrison Hash. Hash was as focused as he always is, never taking his eyes off his opponent, and dishing out constant punishment! Hernandez's resolve was called into question more than once, but he answered with his 'Apparition #14' Spear to score the win after around 11 minutes! Deeley questioned the validity of Andrews' statement... and asked how he can EVER be the 'easy route'... He listed his accolades... Former CGC Canadian, and former CGC World Champion... Named #104 Wrestler in the WORLD last year... The 'easy route', would have surely been Sonny Wildside... The youngster still has a LOT to learn... and a lot to prove... Aaron Andrews said that if Deeley wants to 'prove' he wasn't the weakest man in the Four-Way Match at Glory, he can fight him later tonight... James Hernandez allowed the argument to continue, but then said that whoever wins out of Andrews and Deeley, can be his Mid Summer Madness opponent!! Wade Orson lived up to his moniker tonight, as he really was 'Awesome'. As for Lord James King, he was not a 'Gentleman' at all. He used every underhanded tactic he could think of, and then seemed surprised that he was being booed out of the building! In the end, he hit a brutal looking kick to Orson's face, but the young Brit kipped up to hit his 'Bounce Back' finisher! World's Most Wanted argued that Edd Stone cheated in their match, which he did, with a low blow to Thrill Seeker... They also argued that The Stone Brothers don't deserve to be Tag Team Champions, after Edd turned on Duane right after they won the Titles... The CanAm Blondes won the incredible Main Event from Glory this past Saturday, while Cameron Vessey and Christian Price believe they are twice the tag team the Blondes are... Price and Vessey also ended World's Most Wanted's FIRST reign as Tag Team Champions!! Nothing was settled tonight, but all three teams said they'd go and see Alex DeColt within the week!! This was a re-match from Glory, which Mayhem won comfortably on that night. Tonight, things were a little closer, but Donte Dunn and Erik Strong came up against a brick wall in Mutant. A charismatic brick wall, but a brick wall nonetheless. He dominated the two fan favourites at times, and was on hand to squash Dunn on the outside of the ring with a splash while Aldous Blackfriar made Strong tap out to his 'Batwing' finisher. A one-sided match here in which The Mavericks proved how good they are as a duo. John Maverick and Julian Watson isolated High Ancrie, and kept Mark Griffin on the apron. Eventually, Griffin came in off the hot tag, but after a short flurry, he was rendered helpless by Maverick's 'Deadly Silence' Sleeper Hold. Ancrie got back in to break it up, but Watson hit him with his 'Tiger Claw DDT'. Griffin passed out, and the match was over! This was a fantastic clash of styles. 'Shooter' Sean Deeley can outwrestle almost anyone, but uses his three fellow 'Shooters' at ringside to gain unfair advantages. He did that in abundance tonight, and caused the charismatic brawler Aaron Andrews to lose his focus and get angry on occasion. Deeley thought he had Andrews beaten, and so he took his foot off the gas late on. For the finish, he whipped Andrews off the ropes, attempting a back body drop. Andrews leapt over Deeley, and then from the other ropes, he springboarded back off them. He hit Deeley with a 'Flying Body Press', and rolled him up on landing! Deeley kicked and kicked but he couldn't get a shoulder up in time, and Andrews scored the win! Sean Deeley was furious after the match, and sent his 'Shooters' after Aaron Andrews... 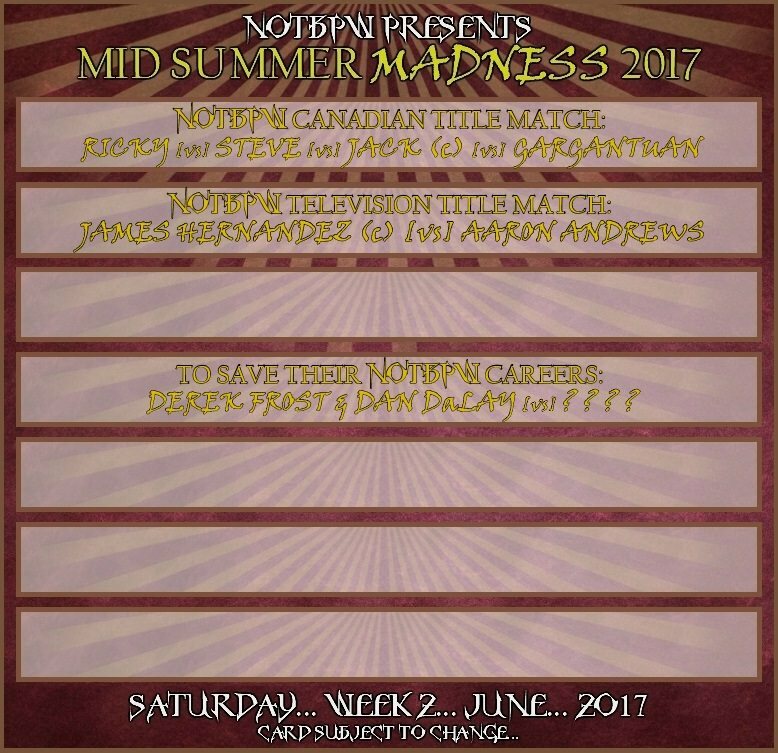 But 'The Ace' was expecting it, and he got away... Deeley was left seething in the ring as Ernest Youngman, Dean Waldorf and Marv Statler came back to his side... Andrews will now head to Mid Summer Madness to take on James Hernandez for the NOTBPW Television Championship!! Steve DeColt and Tim Westybrook brawled all over the arena tonight, almost getting counted out a few times. Westybrook knew he could overpower the DeColt brother outside the ring, and slammed him into the ring steps and ring post. He also used the guard rail to his advantage, including trying to crush DeColt's windpipe across it! 'The Outsider' fought back though, and didn't allow Westybrook to bully him. The former seven time World Champion hit his 'DeColt Stampede' finisher to finish Westybrook off after around fourteen minutes. In the same week we put on an 81 rated show that was decent but unspectacular, United States Pro Wrestling (USPW) would put on their 'American Wrestling' show, which runs the same night as us, and score an 86! They cheated though, because their Main Event was a Double Count Out Tag Team Match featuring Rich Money, Remo, Steve Frehley and Enygma! It scored a 94!